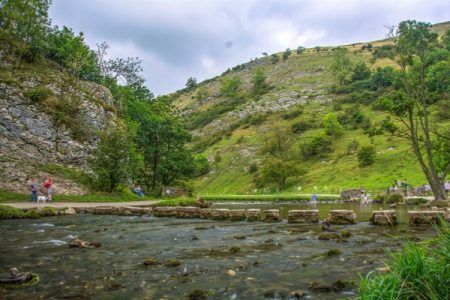 Although Dovedale refers to the majority of the route along which the River Dove flows, when we hear the word Dovedale, we immediately think of those iconic stepping stones for which it is so famous. From a tourist point of view, we tend to think of Dovedale as the 3 miles or so section of the river between the stepping stones under Thorpe Cloud and Milldale. Where does the River Dove go? The Rover Dove rises on Axe Edge Moor near Buxton and then heads south through the limestone landscape of the southern Peak District. For the vast majority of its 45 mile course, the river marks the boundary between Staffordshire and Derbyshire. The Rover Dove joins the River Trent at Newton Solney, near Burton upon Trent. The stepping stones were originally laid in about 1890 for Victorian tourists who would take donkey rides along the riverside. The river itself was made famous long before that when Izaak Walton and Charles Cotton wrote ‘The Compleat Angler’. The Ashbourne to Buxton railway stopped at Thorpe Cloud station which made Dovedale very accessible to tourists in the early part of the 20th century. The stones and other parts of the Dovedale valley were passed into the care of the National Trust in 1934. 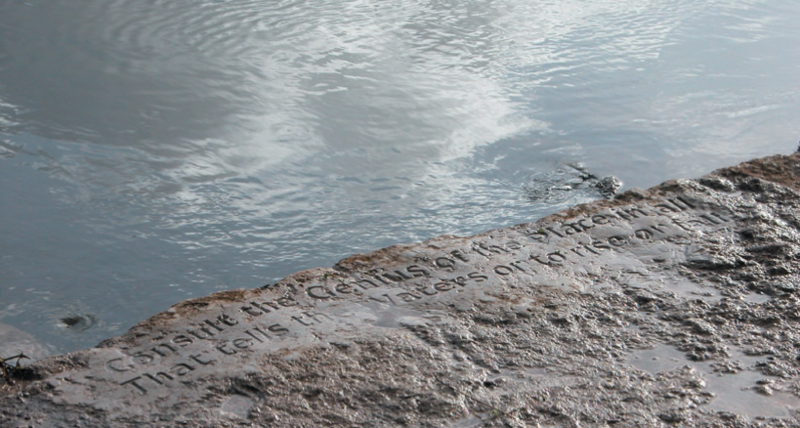 Over time thousands have crossed the river using the stones and they became uneven, worn and slippery. When the water ran high they sometimes flooded. For safety and to help prevent people slipping, the original stones were controversially “capped” in 2010 with uniform limestone slabs. As they are now higher, it is much less likely they will be flooded. We just need another 100 years use to recreate the wear and charm of the original stones! Milldale village is a very pretty village with quaint houses. It’s a great place to start a walk along the river. The bridge, Viators Bridge is a packhorse bridge that been in use since medieval times. Thorpe Cloud is the very conical hill close to the stepping stones. When we are travelling home from the south, we know that we are getting close when we see its very distinctive shape. Dovedale is about 20 minutes by car from Ashbourne. It’s about 40 minutes to either Bakewell or Buxton. 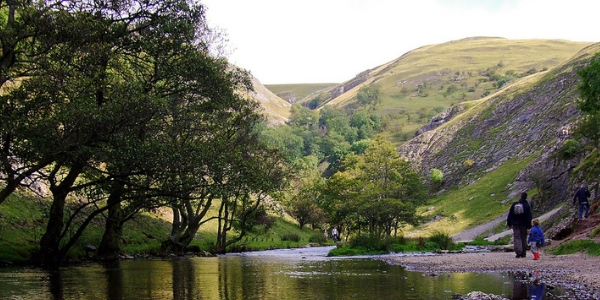 Dovedale is approximately 30 minutes by car from the cottages. There is a privately owned car park for Dovedale. The closest postcode is DE6 2AX. There are signs for parking as you get close. You can also follow directions to the Isaac Walton hotel which will get you very close. The stepping stones are then a 10 minute walk from the car park on the tarmac. From there, you can walk for as long or as little as you wish. If you are feeling energetic then take the opportunity to stride up Thorpe Cloud, the very conical looking hill, The views from the top are well worth the effort. Can you take dogs to Dovedale? 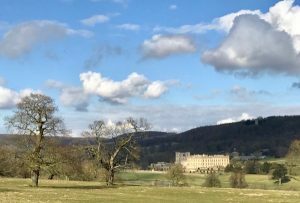 The National Trust property, Ilam Park, is only a couple of miles away from the Dovedale car park. There, you’ll find a tea room and dog watering bowls. You’ll stand a better chance of seeing some of the river’s bird life – dippers, kingfishers, herons – if you head away from the crowds. If you’ve found this post helpful or interesting then please do share it. 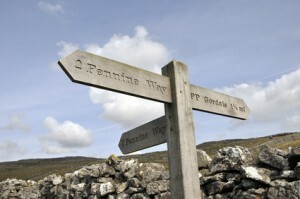 It is 50 years ago this week since the opening of the Pennine Way, the 268 mile grandad of long distance paths in Britain. The route runs from Kirk Yetholm in Northumberland to Edale along what has become known as the backbone of England. The route was conceived back in the 1930s by journalist and rambler, Tom Stephenson who was inspired by the long distance trails of the United States. It was to take 30 years, however, to see the dream become a reality. It is estimated that quarter of a million people use at least part of the trail every year. This number of people obviously has a big impact on the trail itself so many sections have to be actively managed with flagstones and duckboards. If you wish to complete the walk you can expect to cross more than 430 stone and wooden stiles, open and close in the region of 280 gates and cross 200 bridges! There will be more than 450 route marks to ensure you stay on the right path. I remember being inspired to complete the long distance route when just a child – not that I have actually done it! Birthday celebrations are taking place this weekend with more than 50 circular walks taking in the majority of the long distance route. 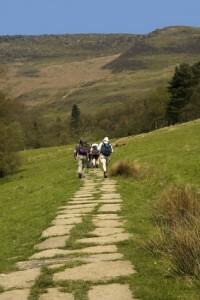 Closest to us, celebrations take place in Edale from Friday 24th April until Sunday 26th. The Roaches – A spot of Wallaby Spotting? 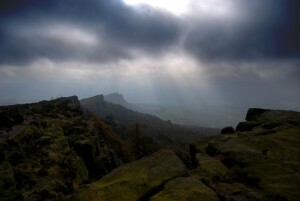 North of leek and south of Buxton, the Roaches are regarded as an “Area of Outstanding Natural Beauty”. On top of the rocky outcrop you can see (weather permitting!) the plains of Cheshire to the west and the forbidding moors and dry stone walls of this corner of the Peak District to the east. 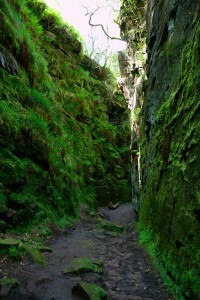 Lud Church is a 15m deep, 100m long chasm which you can walk through. Said to be the inspiration for the Green Chapel in 14th century tale of Sir Gawain and the Green Knight it was formed by a landslip. Having its own microclimate, it is a great environment for ferns and mosses to thrive, and for walkers seeking some shelter from the wind! In the summer, you should look out for peregrine and red grouse in the air. On the ground look out for wallabies (yes, I’m serious!) last seen in late 2014. Originally they were released from Whipsnade Zoo in the late 1930s. The genetic pool of the released animals was limited and very close so it was believed that they had died out. It would be fabulous to think that this wasn’t the case and that they are still there. 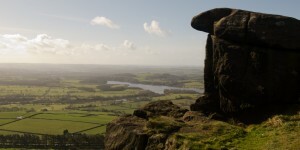 The Roaches Appreciation Society web site is a great resource for finding out more about the area. Follow this link for a challenging walk in the area. There are maps in Hayloft, Byre and Jasmine Cottages that cover the area.